The Fairy Godmother Academy’s Book 5 – Sumi’s Book is coming out on December 27th! In honor of the latest book, we are giving away a special prize to our loyal fans. 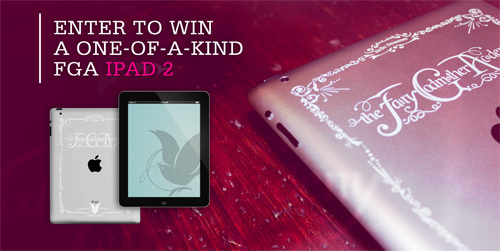 Enter for a chance to win a shiny new iPad 2. This one-of-a-kind 16gb iPad 2 comes laser-etched with the FGA logo on the back. Enter now for a chance to win this special holiday gift from The Fairy Godmother Academy. I really want an ipad! I want an ipad too.